Over 20 years after the collapse of Ceauşescu’s regime the problem of child abandonment in Romania is still crucial. According to the Romanian National Authorities in 2008 more than 70,000 children were in the care of the state, 20,000 were institutionalized and still 1,817 children were abandoned at birth. 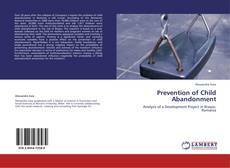 The aim of this work is to analyze the determinants of child abandonment in the city of Braşov. The research is based on a new dataset collected on the field on mothers and pregnant women at risk of abandoning their child. The phenomena appeared complex and involving a various series of aspects. Poverty is a significant factor and receiving economic subsidies have a positive effect on the prevention of child abandonment. Nevertheless it is not exhaustive: family breakdown and single parenthood has a strong negative impact on the probability of preventing abandonment. Gender and sickness of the newborn influence the separation decision in terms of preference for males and healthy child. Furthermore, antecedents of institutionalization matters: having a sibling that has been abandoned influence negatively the probability of child abandonment prevention for the newborn.